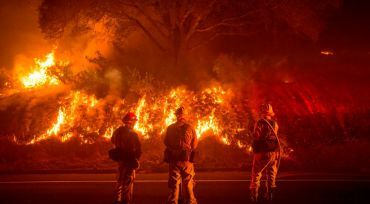 SONOMA, Calif. — Deadly wildfires roared across California on Monday, forcing evacuations and destroying homes and businesses in their paths. The biggest fires burned in the wine country of Napa and Sonoma counties.Here’s what we know so far, according to California authorities. • Ten people have died and the number is expected to grow. • A wildfire in Anaheim, in Southern California, has spread to 4,000-5,000 acres and burned at least six buildings.